Sells as an individual bottle of Bullyade. Dogs love the meaty flavor! Choose the flavor and how many bottles you want below. 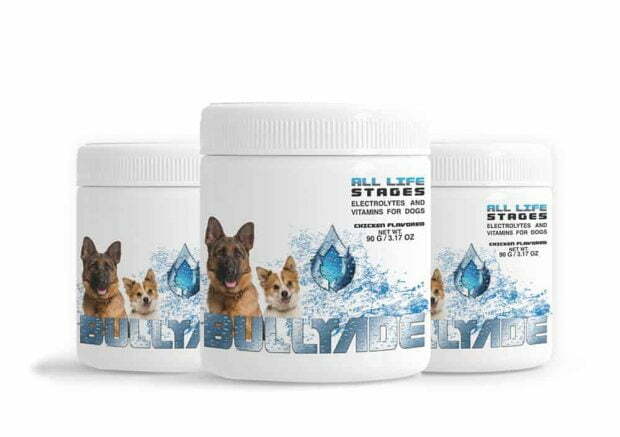 A delicious BEEF or CHICKEN flavored dog supplement that mixes with water. Natural healthy electrolyte replenishment for smoother function of joints and hips with healthier skin and coat. Helps your dog recover more quickly from illness without complications. Just what your dog needs to avoid or recover from dehydration. You get a big 3.17oz to help your dog build stronger health and feel better fast. 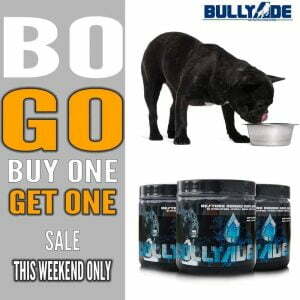 Bullyade Electrolytes for dogs / Vitamins for dogs makes this the ultimate one a day for your dog. Works for all breads, all ages, both male and female. Contains Vitamin A, B complex, C, D, E, Calcium, Magnesium, Copper and many more. All in a convenient mix for water or other favorite liquid. Skip the big hard to swallow pills. No wonder Bullyade is used and prescribed by Vets all over the world. Keeps your dog in great health all year round. Replenish fluids to fully hydrate your dog during warm weather or during or after illness. This gives dogs the extra nutrients they need to recover faster and more successfully from Parvo and other common viruses. This works to ease the symptoms of Diarrhea, Lethargy, Distemper and more. Many Nutrients are missing in most dog foods. Canine digestive systems also don’t always get all the necessary nutrients from dog food. 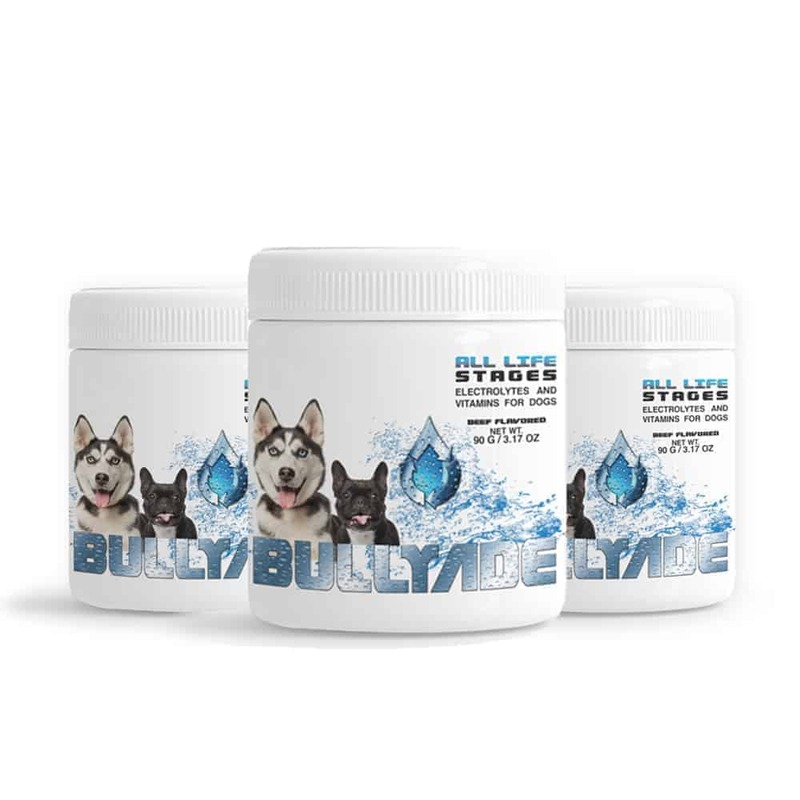 Bullyade electrolytes for dogs and vitamins for dogs is the natural burst of vitamins, minerals, and nutrients to improve health and maintain excellent wellness. Helps return the sparkle to your dog’s eyes and the energy to her step. Make sure your furry best friend is getting the improved nutrition he or she needs. Our policy ensures this will be your best bet for a pleasing no-risk purchase. Many people are stocking up with 2 or 3 of these to continue the benefits for months. HURRY AND BUY NOW while we have this popular canine supplement in plentiful supply. It sells quickly. This makes a fine birthday gift, holiday present, or anniversary gift for anyone with a dog! Packed with 18 essential vitamins and minerals with complete electrolyte replenishment. With Salt, Chloride, Potassium, Magnesium, Calcium, and Phosphorus. Regulates body temperature and prevents dehydration. This gives your dog everything he or she needs to stay well, be healthy, and recover from illness more quickly. 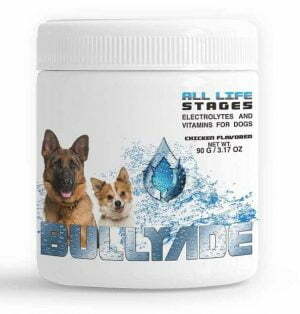 No wonder Bullyade is recommended by Vets all over the world, often to help dogs recover faster from Parvo and other viruses. This can help a dog who has been experiencing digestive problems. Builds better health to benefit dogs of all ages, breeds, and both sexes. Each container holds 3.17oz of tasty mix that can go in water. Dogs love it!